Giants are mentioned across the globe. No matter where we look, nearly all ancient cultures speak of ancient legends which detail how in the distant past, beings of immense height ruled over the lands. In the Odyssey, Homer mentions giants who were a race of large and wild beings ruled by Eurimedon, who lived in the far west, on the island of Thrinacia. These beings were exterminated by Eurimedon himself because of their insolence towards the gods. Homer considered Giants, as well as the Phaeacians, Cyclops, and Lestrigons, one of the indigenous races that (with the exception of the Phaeacians) were destroyed by the gods due to their authoritarian insolence. Meet the ‘Giants’ of Romita, Guanajuato. In 1995, in the Mexican municipality of Romita, located in the state of Guanajuato, a professor of plastic arts and sculpture, called Tito Serrano, found seven skeletons buried in the ancient style of the Otomíes and Chichimecas, native cultures of the area. After an exhaustive analysis carried out by the National Institute of Anthropology and History (INAH), it was determined that the remains had very singular anatomical proportions. 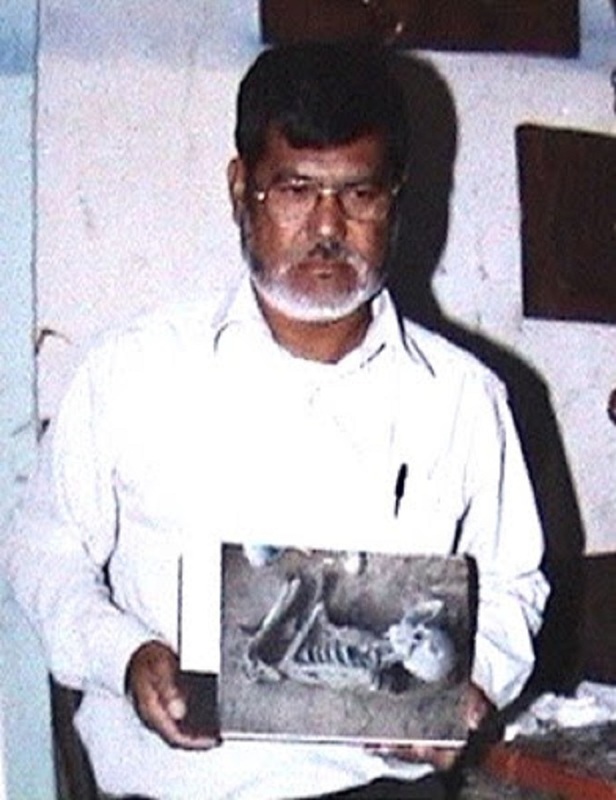 Tito Serrano shows a photo of the skeletons, Gigantes de Romita Guanajuato. Amazingly high considering that the size of the inhabitants of the place was about one and a half meters in height. Among the peculiarities that also caught the attention of experts were their skulls shaped like a light bulb and with ocular cavities too large, unlike those of ordinary humans. The bones were transferred to the Institute of Anthropology and History of Guanajuato, where they allegedly remain stored. There are testimonies of various Spanish conquistadors, in which it is narrated that the Aztecs believed that their lands had formerly been inhabited by men and women who very extremely tall, but all of them died off after a massive war in the region. 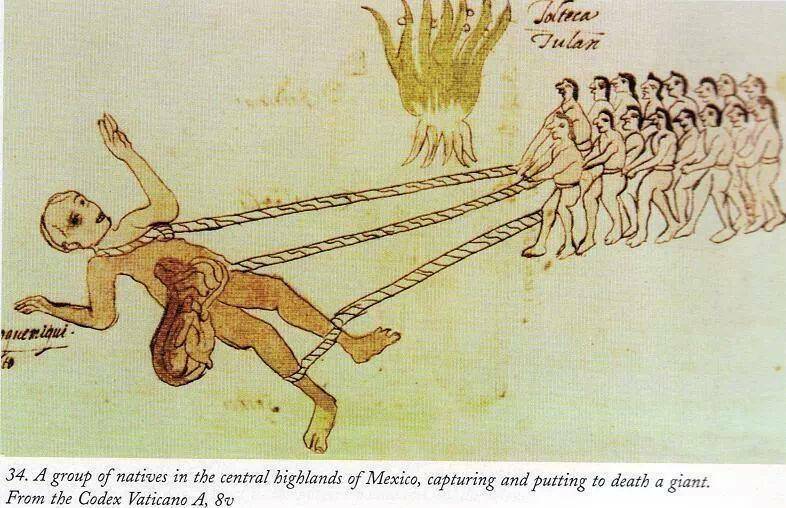 Interestingly, if we take a look at the Codex Rios or the Vatican A Codex, the Italian translation of an ancient manuscript written during the Spanish Conquest, Giants inhabited Mesoamerica. According to the depictions of the codex, Aztec warriors even fought against these giant beings. The Quinametzin Giants, according to Aztec Mythology, populated our world during the previous era of the Sun Rain. Furthermore, it is said that the Quinametzin giants built the ancient citadel of Teotihuacan (Place where men become Gods) and the Great Pyramid of Cholula—considered the largest Pyramid ever built. The ten Quinametzin are mentioned in ancient Aztec mythology. It is said that when the Spanish conquistadores came to America, they saw, real flesh and blood giants.